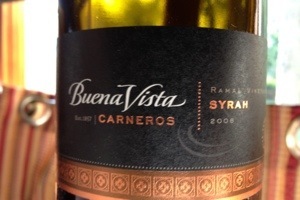 Syrah isn’t my favorite red but this Buena Vista offering rang all the bells. Earlier this week my wife and I were in a beer state of mind but last night our favorite Sonoma vineyard beckoned. It poured out fragrant and fruity, a hint of spice hidden just below the surface, and was a great compliment to our pork chops with dijon mustard sauce, white rice with home-grown scallions, and mixed (i.e., green and wax) beans. You always know you’ve got a good bottle going when you look at it half full and are disappointed that it’s a work night…but that does make it all the better when you resume the “challenge” the next evening. The 2008 was again equal to the task, its rich ruby red the perfect companion to our pasta dinner this evening. I know without looking that the experts would praise this wine; we surely do too. Thankfully we have more Buena Vista shelved and look forward to the next occasion, or even none at all, to break one out. This entry was posted in Syrah and tagged california winemaking, USA.